Researchers have identified blood-based biomarkers in patients with active tuberculosis (ATB) that could lead to new blood-based diagnostics and tools for monitoring treatment response and cure. The study was published online March 30 in the Journal of Clinical Investigation. It was led by TB immunologist Jyothi Rengarajan, PhD, assistant professor of medicine (infectious diseases), Emory University School of Medicine and Emory Vaccine Center and Yerkes researcher, and Susan Ray, MD, Emory professor of medicine (infectious diseases) and Hospital Epidemiologist at Atlanta’s Grady Memorial Hospital. Tuberculosis (TB) is a major global public health problem. In 2013 alone, there were an estimated nine million cases of ATB disease, and 1.5 million people died from TB. In addition, the World Health Organization estimates that two billion individuals are asymptomatically infected with Mycobacterium tuberculosis (Mtb), the bacterium that causes TB, and are considered to have latent Mtb infection (LTBI). Individuals with LTBI can activate to full blown ATB when their immune systems are weakened. Indeed, the risk of developing TB is up to 20 times greater in people living with HIV, and one in four AIDS-related deaths each year is due to TB. First author of the research article is Toidi Adekambi, PhD, research associate in the Rengarajan lab and at Emory Vaccine Center. The research team sought to identify blood-based biomarkers in patients with ATB. They hypothesized that expression of immune activation markers on Mtb-specific T cells would be associated with the amount of bacteria present within an infected individual and could thus provide a gauge of Mtb infection. They reasoned that individuals with ATB disease would harbor higher frequencies of immune markers CD38+/HLA-DR+/Ki-67+ in their blood than those with LTBI or those who had cleared their infection after successful treatment. For this study, the researchers enrolled three groups of individuals in the metro Atlanta area: those with asymptomatic LTBI; patients with un-treated ATB; and patients undergoing treatment for ATB. They found that the frequencies of Mtb-specific CD4 T cells that expressed immune markers CD38, HLA-DR and Ki-67 accurately identified ATB patients with 100 percent specificity and greater than 96 percent sensitivity. They also were able to validate the ability of these biomarkers to accurately classify ATB and LTBI in an independent cohort from South Africa. These markers also distinguished individuals with untreated ATB from those who had successfully completed anti-TB treatment and correlated with decreasing bacterial loads during treatment. “In order to reduce the burden of TB globally, identifying and treating all TB cases is a critical priority,” notes Rengarajan. “However, accurate diagnosis of active TB disease remains challenging, and methods for monitoring how well a patient responds to the six-to nine-month long, four-drug regimen of anti-TB treatment, are highly inadequate. Currently, diagnosis of pulmonary ATB relies on extensive evaluations of clinical symptoms, X-ray assessments and direct detection of Mtb bacteria in a patient’s sputum, which is essentially mucus that is coughed up from the lower airways. 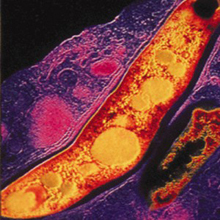 The most widely used sputum-based test involves microscopic detection of Mtb in sputum smears, but the test is poorly sensitive and a high proportion of TB cases are smear-negative. Nucleic acid amplification-based tests are more sensitive for diagnosing ATB but do not differentiate between live and dead Mtb bacteria and are therefore not useful for monitoring clearance of Mtb during and after treatment. Culturing Mtb from sputum is currently the gold standard for TB diagnosis and for monitoring treatment response, but takes three to six weeks for results due to the slow growth of Mtb. Sputum samples are also difficult to obtain, particularly in children, elderly and weakened/bed-ridden patients and therefore, blood-based tests are attractive alternatives to sputum-based tests. However, no blood-based tests for ATB are currently available. “Our findings show that blood-based biomarkers have the potential to accurately diagnose ATB and discriminate between ATB and LTBI,” says Rengarajan. “We are now interested in evaluating these biomarkers in larger studies in TB-endemic areas and across a roader spectrum of Mtb infection, including extra-pulmonary TB and in HIV-infected populations. The research was funded by Emory University, including the Emory Center for AIDS Research and the Emory Global Health Institute, the National Institutes of Health, and Yerkes National Primate Research Center.